Area: 458 sq. km. (about 190 sq. mi.) in eight main islands plus more than 250 islets. 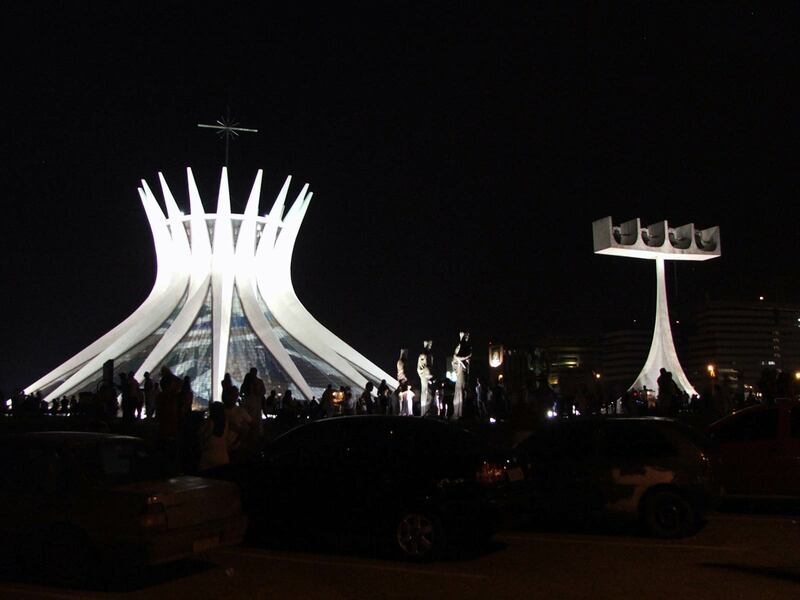 Cities: Capital: Melekeok (pop. 391). Terrain: Varies from mountainous main island to smaller, reef-rimmed coral islands. Nationality: Noun and adjective — Palauan. Population: Approximately 20,000 (non-Palauan population, approx. 6,000). Age structure — less than 15 years old, 5,150; 16-64 years old, 13,600; more than 65 years old, 1,130. 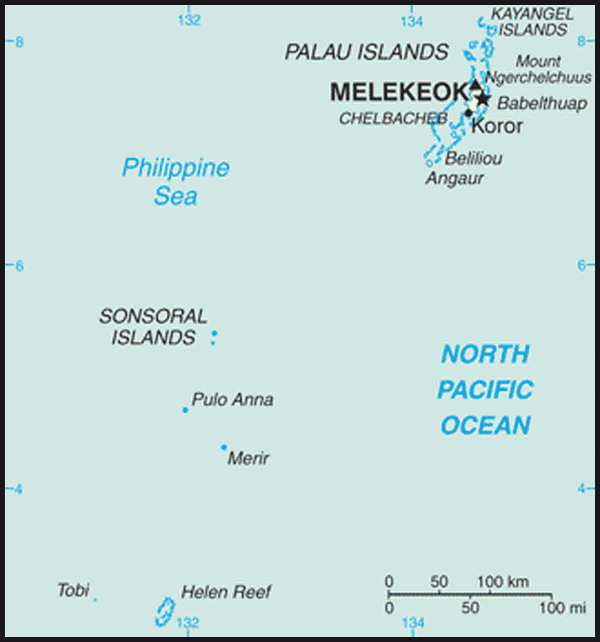 Ethnic groups: Palauans are Micronesian with Malayan and Melanesian elements. Religion: Roman Catholic, Protestant, Modekngei (an indigenous Palauan religion). 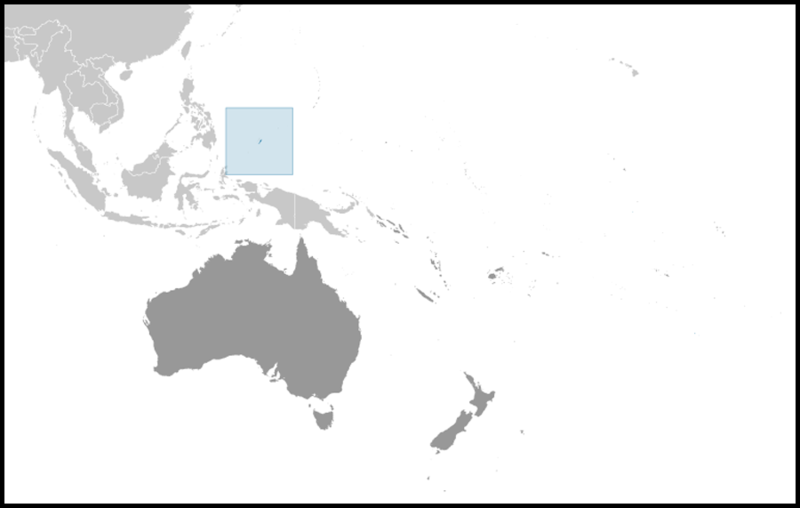 Languages: English (official in all 16 states), Palauan. Health: Life expectancy: male 68 years; female 76 years. Infant mortality rate — 16.2/1,000. Work force: Public sector: 33%; private sector — 67%. Type: Constitutional republic in free association with United States. Independence (from U.S.-administered UN trusteeship): October 1, 1994. Branches: Executive: president (head of state and government), vice president, cabinet. Legislative — bicameral parliament elected by popular vote. Judicial — Supreme Court, National Court, Court of Common Pleas, and the Land Court. GDP (2009 est. ): $178.4 million. GDP per capita (2009 est. ): $8,941. National income (GDP + foreign assistance): estimated to be over $200 million. National income per capita: estimated at $10,000. GDP composition by sector: Trade: 21%, public administration — 20%, construction — 15%, hotels and restaurants — 10%, finance and insurance — 8%, transport and communication — 8%. Industry: Types: trade, government, construction, tourism. Trade: Exports ($5.9 million, 2004): fish, handicrafts. Export markets — U.S., Japan, and Taiwan. Imports ($129.5 million, 2008) — fuel and related minerals, machinery and transport equipment, beverages and tobacco, manufactured goods, and food and live animals. Import sources — U.S. (Guam), Japan, Singapore, Taiwan, and Korea. External debt (2006): $38 million. Palau was initially settled more than 4,000 years ago, probably by migrants from what today is Indonesia. British traders became prominent visitors in the 18th century, followed by expanding Spanish influence in the 19th century. Following its defeat in the Spanish-American War, Spain sold Palau and most of the rest of the Caroline Islands to Germany in 1899. Control passed to Japan in 1914 and then to the United States under United Nations auspices in 1947 as part of the Trust Territory of the Pacific Islands. Four of the Trust Territory districts formed a single federated Micronesian state in 1979, but this eventually dissolved as the individual districts — long culturally distinct — opted for more locally popular status. Palau approved a new constitution in 1981, subsequently signing a Compact of Free Association with the United States in 1982. After eight referenda and an amendment to the Palauan constitution, the Compact went into effect on October 1, 1994, marking Palau's emergence from trusteeship to independence. Palau is a democratic republic with directly elected executive and legislative branches. Presidential elections take place every 4 years, at the same time as the United States' presidential election, to select the president and the vice president, who now run as a team. The Palau National Congress (Olbiil era Kelulau) has two houses. The Senate has 13 members elected nationwide. The House of Delegates has 16 members, one each from Palau's 16 states. All of the legislators serve 4-year terms. Each state also elects its own governor and legislature. In November 2008 Palauans elected a new president and vice president: Johnson Toribiong and Kerai Mariur. They took office on January 15, 2009. The same elections brought sweeping change to the legislature and passed more than 20 amendments to the constitution. Palau maintains an embassy at 1700 Pennsylvania Avenue, Suite 400, Washington, DC 20006 (tel: 202-452-6814, fax: 202-452-6281). The Republic of Palau's Mission to the United Nations is located at 866 United Nations Plaza, Suite 575, New York, New York 10017 (tel: 212-813-0310, fax: 212-813-0317). Palau also has embassies in Japan, Philippines, and Taiwan. The government is stable, with national elections held every 4 years in the executive branch and Congress. Elections are free and fair, and candidates rely heavily on media campaigns, town meetings, and rallies. There are no political parties, and candidates run on their own platforms. Palau's per capita GDP of $8,941 makes it one of the wealthier Pacific Island states. Nominal GDP increased by an annual average of nearly 14% from 1983 to 1990, and by an annual rate of over 10% from 1991 to 1997. Growth turned sharply negative in 1998 and 1999 as a result of the Asian financial crisis, but a gradual rebound followed, and the economy grew by 5.6% in 2007. Tourism (and its attendant infrastructure changes) is Palau's main industry. Its major draws are its diverse and pristine marine environment, and its above-water tropical island beauty. The number of visitors — 31% from Japan, 35% from Taiwan, 17% from Korea, and 8% from the U.S. — was over 100,000 in 2011, a 13% increase from 2010. Continental Airlines has direct flights to Palau from Guam and the Philippines. Delta Airlines has weekly non-stop flights from Narita, Japan to Palau. Japan Airlines runs chartered flights from Tokyo, and Korean Airlines does the same from Seoul on a seasonal basis. Palauan tourism and environmental authorities would like to adjust the industry, simultaneously decreasing tourist volume and increasing income by attracting more high-dollar tourists. The service sector dominates the Palauan economy, contributing more than 50% of GDP and employing more than half of the work force. The government alone employs about 30% of workers and accounts for 20% of the GDP. Construction is an important industrial activity, contributing over 15% of GDP. Several large infrastructure projects, roads, and hotels have boosted this sector's recent contribution to GDP. Agriculture is mainly on a subsistence level, the principal crops being coconuts, taro, and bananas. Fishing is a potential source of revenue, but the islands' tuna output dropped by over one-third during the 1990s. Fishing industry revenues are mostly from license fees from fishing vessels. One of the government's main responsibilities is administering external assistance, and the main economic challenge confronting Palau is to ensure the long-term viability of its economy by reducing its reliance on foreign assistance. Under the terms of the Compact of Free Association with the United States, Palau received more than $800 million in direct assistance over 15 years and exercised its prerogative to participate in a wide range of federal programs. In early September 2010, the United States and Palau concluded a 15-year comprehensive review of the Compact. A wide range of federal programs will continue for the next 15 years. By the end of 2010, the value of a trust fund set up under the Compact was approximately $160 million. Palau gained its independence October 1, 1994 with the entry into force of the Compact of Free Association with the United States. Palau was the last component of the Trust Territory of the Pacific Islands to gain its independence. Under the Compact, the U.S. remains responsible for Palau's defense for 50 years. The two countries concluded a comprehensive review of the Compact in 2010. Palau is a sovereign nation and conducts its own foreign relations. Since independence, Palau has established diplomatic relations with a number of nations, including many of its Pacific neighbors, and is one of two dozen or so nations that have diplomatic relations with Taiwan. Palau was admitted to the United Nations on December 15, 1994, and has since joined a number of other international organizations. Palau is a dependable supporter of U.S. positions in the UN. The mailing address for the U.S. Embassy (http://palau.usembassy.gov/) is P.O. Box 6028, Republic of Palau 96940. Telephone: 680-587-2920. Fax: 680-587-2911. email: USembassyKoror@palaunet.com.